This article is about the town. For the parish, see Saint Andrews Parish, New Brunswick. Saint Andrews (2016 population: 1,501) is a town in Charlotte County, New Brunswick, Canada. It is sometimes referred to in tourism marketing by its unofficial nickname "St. Andrews By-the-Sea". It is also known as "Qonasqamkuk" by the Peskotomuhkati (Passamaquoddy) Nation. 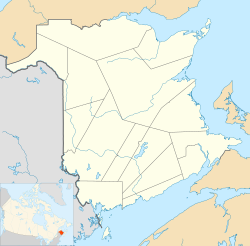 Saint Andrews is located at the southern tip of a triangular-shaped peninsula (15 km on the west side, 12 km on the east side) extending into Passamaquoddy Bay at the western edge of Charlotte County. It is the shire town of the county. The town's street grid, laid out by Charles Morris about 1783,:p45 is oriented toward the waterfront, which faces Saint Andrews Harbour and the Western Channel, which is formed by Navy Island. Saint Andrews Harbour is situated at the mouth of the St. Croix River and the town sits on the river's east bank at its discharge point into the bay. The town is directly opposite the community of Robbinston, Maine, 2 kilometres to the west across the river mouth. In addition to Navy Island, Ministers Island is another island in Passamaquoddy Bay that is adjacent to the town on its eastern boundary. Despite its proximity to the Canada–United States border, the nearest border crossings are 30 km away at St. Stephen or via a ferry service at Deer Island. This climatic region is typified by large seasonal temperature differences, with warm to hot (and often humid) summers and cold (sometimes severely cold) winters. According to the Köppen Climate Classification system, Saint Andrews has a humid continental climate, abbreviated "Dfb" on climate maps. Previous to the establishment of European settlers in New Brunswick, the people of the Peskotomuhkati settled the Saint Andrews peninsula and used the southern point as meeting place. "Qonasqamkuk", as Saint Andrews is known to the Peskotomuhkati (Passamaquoddy) Nation, is often referred to as the place of "the ancient fireplace". In recent years site is locally known as "Indian Point". Saint Andrews was founded in 1783 by United Empire Loyalists, including John Dunn of Staten Island, New York, and named in honour of St Andrews, Scotland. The town is well preserved, with many original buildings still in place (some of which were floated to the town on barges from Castine, Maine at the end of the Revolutionary War). There are many layers of history visible starting from the late 18th century, including the town's well-known formal grid street layout and many historic buildings. Many of the commercial buildings on Water Street date from the 19th century. Between 1820 and 1860, the port of Saint Andrews was used extensively during the Irish Migration. The Irish were first quarantined at Hospital Island, situated a few kilometers in Passamaquoddy Bay. By the 1851 Census, more than 50% of the town's population had been born in Ireland. The town's first seaside hotel, the Argyll, opened in 1881 followed in 1889 by The Algonquin, a resort situated on a hill overlooking the town, making Saint Andrews Canada's first seaside resort community. The old-fashioned Argyll burned down in 1892 and was never rebuilt and the Algonquin burned in 1914 but was rebuilt one year later. It remains an iconic symbol of the town. Important attractions include The Algonquin Hotel, Kingsbrae Horticultural Garden, The Ross Memorial Museum, the Saint Andrews Biological Station, the Huntsman Marine Aquarium, The Sheriff Andrews' House, Minister's Island (the summer home of Cornelius Van Horne), whale watching, fine art and craft galleries, many shops, restaurants and small inns and the charming seaside setting. Saint Andrews is the birthplace of Thomas Storrow Brown, a businessman, journalist, and an officer of the 1837 Rebellion and Victorian artist Edward Mitchell Bannister. The town was, and continues to be a home to noted summer citizens, including steel magnate Sir James Dunn, Fathers of Confederation Samuel Leonard Tilley and Charles Tupper, and William Cornelius Van Horne, General Manager and later, President of the Canadian Pacific Railway. Ministers Island is named after a loyalist Anglican priest, Rev. Samuel Andrews, who settled the island in 1786, but the island is most famous as the summer home of Sir William Van Horne, general manager and visionary of the Canadian Pacific Railway. Located about a five-minute drive from downtown Saint Andrews, what is an island at high tide becomes a peninsula as waters drop toward low tide. The bar, which appears with the receding tide, allows access (across the ocean floor) starting at the end of the Bar Road with crossing times changing daily with the tidal cycles. Tours are available on the island May through October, to see the stone house where Rev. Andrews and his family lived, Covenhoven (the summer cottage of Sir William Cornelius Van Horne), one of the largest livestock barns in North America, and the old windmill that used to power the island. Hikers, photographers, birdwatchers and others are free to explore the many trails on the Island. The aquarium has various exhibits, including a touch pool with sea urchins, seastars, and sea anemones. There is also a pair of harbour seals, Loki and Snorkel. The Huntsman Marine Science Centre is also a part of the aquarium and hosts a number of educational courses, from grade school up to university level courses. St. Andrews Biological Station adjoins the center. Saint Andrews is the shire town of Charlotte County and hosts the Charlotte County Court House, built in 1840 and designed by architect Thomas Berry. The court house is a National Historic Site of Canada and one of the longest operating courthouses in Canada, as it continues to be used for the Court of Queen's Bench of New Brunswick. It is a beautiful example of Gothic Revival architecture and is available for touring through the Charlotte County Gaol, situated next to the courthouse. The Gaol was built of large blocks of local granite in 1832 and continued to be used as such until 1979, despite its archaic construction. It currently is home to the Charlotte County Archives, which boasts a large collection of historical papers, photographs, microfilms of newspapers and selected collections, and research materials for local historians and genealogists alike. The Gaol is purportedly haunted by the ghost of an innocent man hanged for murder in 1879, and was the site of one of Canada's last hangings in 1942. Henry Phipps and Sarah Juliette Ross were world travellers and eclectic collectors. On a vacation to Saint Andrews in 1902 this American couple had a picnic on Chamcook Mountain and fell in love with the area. The Rosses purchased the 1824 house of the Honourable Harris Hatch, a Loyalist. They donated the historic house and their collection to the town. The house has a fine neoclassical interior with grand, curving staircase and elaborate plaster moldings. Each room reflects the Rosses' interests: fine furniture made by 19th-century New Brunswick cabinetmakers, and exceptional handknotted oriental carpets and objets d'art from their travels. The Sheriff Andrews House was built by Elisha Andrews, Sheriff of Charlotte County (from 1805 until his death in 1833.) The Andrews Family was a Loyalist family who moved to Saint Andrews from the British Thirteen Colonies (likely New York or a New England colony) shortly after the American Revolution. The house is open daily for tours by a costumed tour guide, who take visitors through the house, showing what life would have been like in the early 1800s. The Atlantic Salmon Interpretive Centre offers visitors the chance to meet wild Atlantic salmon face-to-face through an underground viewing chamber. Plus it has up-to-date displays on the research being carried out on this charismatic species, on its biology, and on the rich cultural heritage surrounding it. There are easy walking trails along the beautiful Chamcook Stream, and knowledgeable guides to enrich the entire experience. The centre is also available for meetings, special events, and weddings. The blockhouse was built as a coastal defense structure in the War of 1812 between the United States and the British Empire, but never saw action. Twelve similar structures were built, and only the Saint Andrews blockhouse still stands. It was repaired in the 1990s following a fire. Guided tours are conducted during tourist season. Kingsbrae Garden has over 50,000 different plants on display. There are edible gardens, a cedar maze, an ornamental grass garden, rose garden, gravel garden, a virgin Acadian forest trail, streams, a genuine Dutch windmill (1/3 scale), and even a garden called the "Scents and Sensitivity Garden"; built with advice from the Canadian National Institute for the Blind, and designed for the visually impaired, with all plants chosen because they have an interesting smell or texture, and all with names for the plants labelled in English, Latin, and Braille. There are alpacas, pygmy goats, peacocks, ducks, sculptures and a Children's Fantasy Garden where there are free children's activities every day in July and August. Kingsbrae Horticultural Garden is located just a few blocks up the hill from the Saint Andrews Water Street business district and wharf; also just steps from the historic Algonquin hotel. In April 2006 Kingsbrae announced it would be the first public garden in Canada to display the rare Australian Wollemi pine, discovered in 1994 though thought to have been extinct for two million years (CanWest News Service). The St. Andrews Arts Council is dedicated to enriching New Brunswick communities and providing educational and performance opportunities for local, national and international students of all ages and abilities by promoting and encouraging the creation, performance and appreciation of the arts through innovative, multi-disciplinary programs. Since 1986, The St. Andrews Arts Council has offered performing arts courses, master classes and workshops in Opera, Voice, Choir, Drama, Dance, and Instrumental Music, as well as visual art, for students of all ages from beginner to professional. From Wendy Nielsen and Measha Brueggergosman to Lewis Dalvit and Chih-Long Hu, many famous faces have taken part in St. Andrews Arts Council courses and events, either as instructors, students or performers. Sunbury Shores Arts and Nature Centre is a not-for-profit, membership-based organization situated on the shores of Passamaquoddy Bay in Saint Andrews. Since being established in 1964, the centre has helped develop a strong arts community in Saint Andrews through exploring the connections between art and nature. The centre contains artists studios, a printmaking shop, pottery studio, exhibition gallery, reference library and administrative offices; it is open year-round. The Arts & Nature Centre also owns and maintains Two Meadows Nature Trail, a self-guided hiking trail in a nearby wilderness area. On every Thursday morning during the summer months, a local Farmers' Market is held in the town square. It features fresh organic produce and meat, plants, and herbal soap, in addition to ethnic prepared foods of Indian, Middle Eastern, and Mexican cuisines; crepes filled with all kinds of fruit and melted chocolate, and homemade chocolate fudge. Craft items such as teddy bears are also amongst the items for sale. Live music is often played on guitar by one of the local highschoolers, fiddles, and a hammered dulcimer are also played by a variety of local musicians. Saint Andrews features the studios and galleries of many fine artists and craftspeople. Visitors will find original works in landscape and floral painting, sculptor, carving, textile art, fine pottery, wearable art, photography, jewelry and much more. Saint Andrews features many outdoor murals which can be viewed year round. The Saint Andrews Water Tower Mural measures 30' x 150' and includes images of Market Wharf and Kingsbrae Garden. The Drug Store Mural measures 960 square feet (89 m2) and is located on the side of Cockburn's Drugstore. It features images of Water Street and Kingsbrae Garden. The Hardware Store Mural is located on the side of St. Andrews Hardware. It is a 1,200-square-foot (110 m2) mural featuring an image of Saint Andrews as it appeared in 1907. The port of Saint Andrews is home to several whale watching companies that operate on a seasonal basis which begins during the first of May through the first of October. The offices of most of these companies are located at the head of the wharf. Since whales are uncommon in Passamaquoddy Bay, tours tend to stretch past the Fundy Islands and into the Bay of Fundy. Common sightings by St. Andrews tour companies tend to be the northern humpback whale, fin whale and minke whale, along with sightings of other marine life such as the common seal. The only way into or out of Saint Andrews by land is via Route 127, which runs directly through the town. It meets Route 1 on either end of the town. A local community channel, CHCO, serves the Saint Andrews and Charlotte County area. The station launched in 1993 on cable television, and began broadcasting over the air in 2006. George Johnson Clarke, lawyer, journalist, and politician. Premier of New Brunswick from 1914 to 1917. ^ Canada, Government of Canada, Statistics. "Census Profile, 2016 Census - Saint Andrews [Population centre], New Brunswick and New Brunswick [Province]". www12.statcan.gc.ca. Retrieved 2018-06-28. ^ List of Lights, Pub. 110: Greenland, The East Coasts of North and South America (Excluding Continental U.S.A. Except the East Coast of Florida) and the West Indies (PDF). List of Lights. United States National Geospatial-Intelligence Agency. 2015. ^ "Southern New Brunswick". The Lighthouse Directory. University of North Carolina at Chapel Hill. Retrieved 30 March 2017. ^ "St. Andrews, NB". Lighthouse Friends. Retrieved 30 March 2017. ^ NBCC St. Andrews, Campus of New Brunswick Community College. The Diverting History of a Loyalist Town: A Portrait of St. Andrews by Grace Helen Mowat, 1923. "No Hay Fever and a Railroad" by Willa Walker, 1989. Joshua M. Smith, Borderland Smuggling: Patriots, Loyalists and Illicit Trade in the Northeast, 1783–1820 Gainesville, University Press of Florida, 2006. Wikimedia Commons has media related to St. Andrews, New Brunswick.